Speaker quality on smartphones isn’t ever anything to write home about, but they need to be loud enough so one can easily hear ringtones, alarms, person on the other side of the call, etc. While the Galaxy Nexus has received universal critical acclaim, it does have its fair share of shortcomings on the hardware side. A relatively lackluster camera, weak GPS and, one of the bigger sources of complaints, is its particularly tinny speaker. 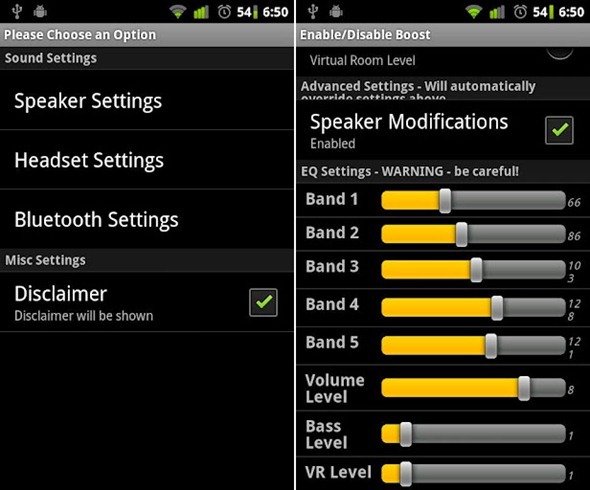 I will be getting myself a Galaxy Nexus soon so I was looking up apps, mods and hacks for the device when I came across Volume+: an enthusiast-favorite app for Galaxy Nexus (though it works for other Gingerbread and Ice Cream Sandwich Android device as well) that increases/enhances speaker, headset, Bluetooth and In-call volume. Check it out after the jump! Volume+ is an application for Android Devices running Gingerbread (2.3) or higher which allows you to boost the maximum volume for Ringtones, Alarms, Message tones, etc. It is essentially a heavily modified DSP Manager which has been completely rewritten from scratch. Once you have installed Volume+ on your device, you can navigate to Settings > Sound > Music Effects and activate Volume+. Then, you can launch the app itself to customize speaker/in-call/headset settings. 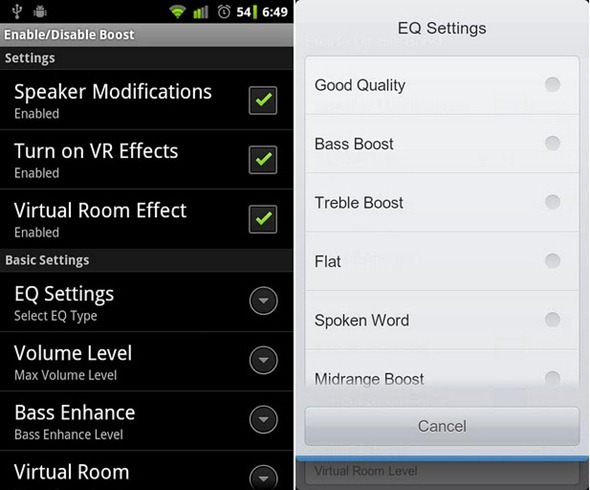 You can choose pre-included EQ settings and personalize your own. While both Volume+’s free and paid versions are available through Android Market, you can actually get the paid version for free legitimately through the developer’s official website. If you find the app useful in that it solves the low volume issue on your device, we actually suggest you go ahead and buy it from Android Market to support the developer. IMPORTANT NOTE: The app is tried and tested on stock Galaxy Nexus, but the developer recommends that you use a custom ROM (such as MIUI) and that you use EQ settings carefully as you may harm your device if used improperly. Neither Redmond Pie nor the developers of this app are responsible for any damage incurred to your device in using Volume+. Don’t forget to let us know of your experience with Volume+ in the comments section over on our Facebook and Google+ page.